As I write for Going Gentle Into That Good Night, I don’t just think in a confined space of caregiving for our loved ones with dementias and Alzheimer’s Disease. That’s important – and the focus of most of the posts here – and the information I provide is practical and addresses daily life for us as caregivers and our loved ones with dementias and Alzheimer’s Disease. I work constantly with the goal of providing what caregivers need in one place and where they will not find anywhere else. The two books I’ve written for caregivers about dementias and Alzheimer’s Disease – Going Gentle Into That Good Night: A Practical and Informative Guide For Fulfilling the Circle of Life For Our Loved Ones with Dementias and Alzheimer’s Disease and You Oughta Know: Acknowledging, Recognizing, and Responding to the Steps in the Journey Through Dementias and Alzheimer’s Disease – are written with the same goal. I was the caregiver for my mom who had vascular dementia, Lewy Body dementia, and Alzheimer’s Disease, as well as congestive heart failure. Someone gave me a copy of the bible on these diseases – The 36-Hour Day – and not only was it written by clinicians who had never actually been through the day-to-day with these diseases, but it didn’t address the very specific things I was seeing with my mom and it didn’t address the in-the-moment things and challenges of daily life that we as caregivers and our loved ones with dementias and Alzheimer’s Disease face and need to navigate through. Most disheartening for me personally was the absence of dignity and love for our loved ones with dementias and Alzheimer’s Disease in a lot of what I read. These people that we love and loved fiercely were treated at worst as mindless, inanimate objects and at best as newborn babies who needed to be stripped of all control and input into their lives. So after my mom’s death in 2012, I decided to do my best to give caregivers what I didn’t and couldn’t find, doing the research, drawing on experience, staying abreast of these neurological diseases and providing what has been the only – and still is – comprehensive resource for caregivers of loved ones with dementias and Alzheimer’s Disease that wasn’t just specific to my mom and didn’t focus on just a single aspect of the breadth and width and length of what caregiving and being cared for entails. Make no mistake, though. My mom is a part of many of my posts because that’s where I got the practical experience, but except for my very personal posts on those days when missing her comes on me full force again, my mom is not the focus of this blog. You the caregivers and your loved ones with dementias and Alzheimer’s Disease are. That is why I continue to take the experiences that you talk with me about and I continue to add to the resources here. My work here will never be done. That is my commitment and my promise to each of you and to your loved ones. One of the things that has become evident over the past few years is that our lifestyles – yours and mine – potentially make most of humanity headed for dementia because we’re creating a fertile environment for neurological degeneration. One of the lifestyle factors that poses, in my opinion, the most significant risk of neurological degeneration to the most people is our increasing addiction to technology. The research in neuroscience backs this up. We have too little absence in our lives from technology. Technology changes our neuroplasticity (the part of the brain responsible for creating neural pathways) and, as a result, there are parts of our brains that are getting short-circuited and bypassed altogether. This leads to cellular atrophy and, eventually, death – the hallmark indicators of dementia. Nicholas Carr’s The Shallows is an excellent book on how this happens. 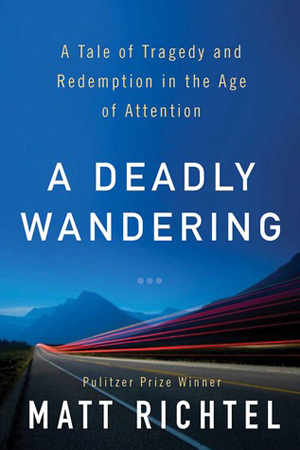 A Deadly Wandering: A Tale of Tragedy and Redemption in the Age of Attention by Matt Richtel looks at another aspect of how technology affects the brain in terms of attention. “Excellent book that weaves an actual story of the unconscious attention deficit created by using technology (in this case, texting, but it applies to all technology) while driving a vehicle with the neuroscience behind the human ability to pay attention (stay focused) with multiple, seemingly-equal, stimuli coming at them all at once (multitasking). The reality is that multitasking, for 99% of us, is a myth we’ve bought into and it’s making us more unable to pay attention to anything for long (there’s a dopamine hit that mimics the same hit that drug and alcohol addicts get with that first snort, draw, liquid ice in the veins or drink – the hit is short-lived, but we’re hooked and we first want it and then we need it), more unproductive, more unconscious in terms of critically thinking and keeping the big picture in focus, and more of a danger, in some cases, fatally so, to ourselves and others. Everyone should read this book. It’s a tough read at times, both in terms of the pain and suffering revealed in all the people discussed in the book and in terms of the fact that when we look in the mirror, we’re most likely going to see the “bad guy” in this book with our faces looking back at us.